Top your Barrett’s Ridge Original beer bread with butter. Glorious, nutty, melt-in-your-mouth butter! Original	Overall rating:	5	out of 5 based on 9	reviews. Pour entire contents of Barrett’s Ridge Original into a bowl. Pulled pork. Just the thought of tender ribbons of pulled pork melting into the fluffy flesh of a slice of Barrett’s Ridge Original is enough to send anyone into a feeding frenzy. So, next time you pop into Woolworths, make sure to grab a bag of Barrett’s Ridge Original, and a tasty tin of prepped pulled pork in the meat section. What’s your serving suggestion? Share it with us on the Barrett’s Ridge Facebook page! Okay, fine. 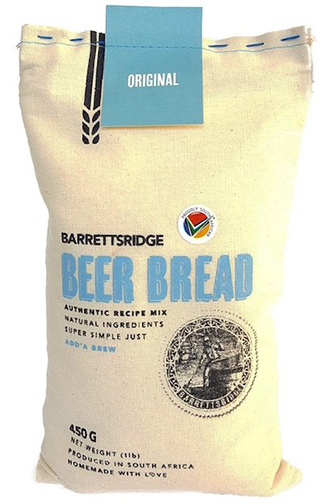 We know we said not to mess with perfection, but if you wake up one day and feel like going on a beer bread baking adventure, then we’d definitely recommend adding biltong to Barrett’s Ridge Original. Homesick friends overseas? Send them this suggestion!